Compatible with caller ID (FSK / DTMF). 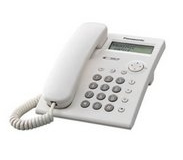 50 Speed-dial memories with 50 caller ID (requires Caller ID subscription to your provider). Display name calling. Menu screen. Select language. Wall mounting. Instructions in Greek included.